How to start tackling the biases that hold students back in STEM. We all hold implicit biases about people that influence our behavior and interactions in ways we don’t even realize. When teachers’ hidden attitudes and beliefs about students are based on race, ethnicity, and/or gender, they may unwittingly communicate negative messages to their black, brown, and female students about their abilities to tackle STEM (science, technology, engineering, and math) subjects. Pervasive stereotypical images of scientists and other STEM professionals (think Albert Einstein) may further reinforce to these students that STEM careers are important, but are not for them. What Can We Do About Implicit Biases? Uncover your implicit STEM biases. Try testing yourself for hidden bias. Which students do you have high versus low expectations of when it comes to math and science? How do these students compare to the images that pop into your mind when you visualize a scientist or mathematician? How might you be expressing these biases to your students? Try making a video of yourself during a science or math lesson and view it later. Notice whom you call on, whom you ignore, and how you respond to individual students’ questions, ideas, and misconceptions. What patterns do you see? Build supportive relationships with students. When teachers communicate confidence in their students’ abilities to meet high expectations, they positively affect student learning. This is especially important in STEM, where students are asked to explore new things, tackle challenging problems, and take risks with their ideas. Your time and positive attention are the most powerful teaching tools you have. Use them! Take advantage of students’ “funds of knowledge.” All students have ideas about the world and how it works based on evidence from their experiences outside of school. Motivate students to make connections between home and school STEM experiences by drawing out their ideas (including their misconceptions) and using them as launching pads for inquiry-based school explorations. Encourage students to express their ideas and thinking using demonstration, role-play, modeling, drawings, visuals, and language. Group children in a variety of ways for STEM activities. Although school culture tends to prize individual effort and achievement, many cultures (and increasingly 21st-century STEM careers) value cooperation and collaboration. Give students opportunities to work with girls and boys of different backgrounds, ethnicities, and languages. Showcase STEM role models who look like your students. Don’t wait until Women’s History, Black History, or Hispanic Heritage months to collect, display, and talk about the work of women, black, and Latino scientists. Are you doing space science? Mae Jemison, the first African American female astronaut to go into space, might be a good choice. Studying earth science or fossils? Consider Luis Alvarez, the Latino physicist who developed the asteroid theory of dinosaur extinction. Display and talk about a variety of STEM careers. Avoid stereotypical images of STEM professionals that portray scientists, for example, as white men with thick glasses, pocket protectors, lab coats, and test tubes. Instead look for a wider variety of images that show scientists, technology specialists, engineers, and mathematicians working in a variety of careers and settings. Evaluate the STEM books in your classroom library. Books give students powerful messages about who excels at STEM. Make sure your classroom library incorporates diversity. Suggestions for elementary classrooms include Rosie Revere, Engineer and Ada Twist, Scientist by Andrea Beaty. Provide children with notebooks in which to record their STEM documentation and encourage them to personalize the notebooks to make them their own. Teachers alone cannot tackle systemic issues of racism, sexism, and ethnocentrism in STEM. For example, before they even enter our classrooms, black and Latino students from low-income communities face an opportunity gap that affords them unequal access to schools, curricula, and teachers that promote “deeper learning” experiences and STEM dispositions. But addressing our own biases and enriching our repertoires of STEM teaching behaviors is a manageable goal that has the potential to dramatically benefit not only our individual students but the STEM community as a whole. 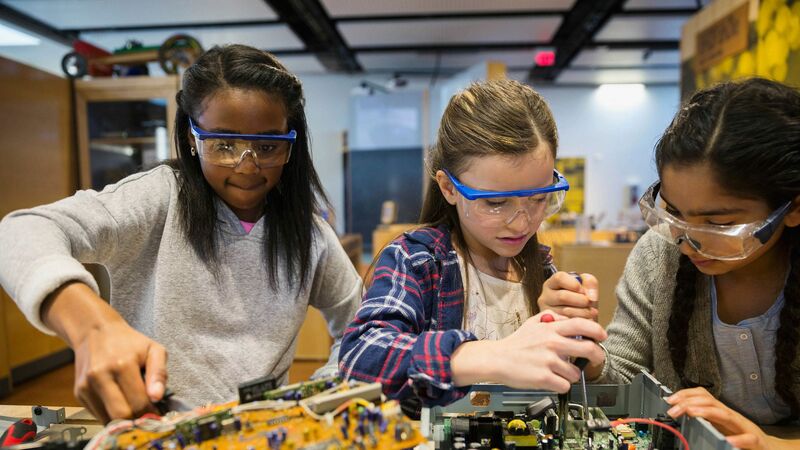 After all, exploration and innovation in the 21st century will depend on a diverse STEM workforce that brings a wealth of experiences, ideas, and perspectives to the table.